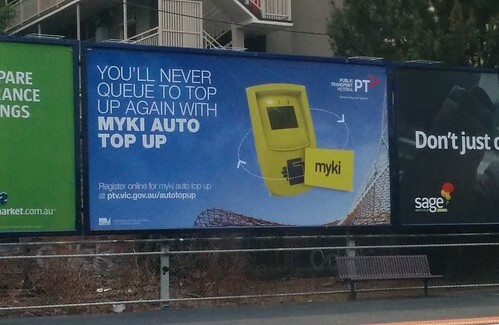 Next → Next post: We could have a vastly more usable PT network; PTV has a plan. It just needs funding. Great comparison. Thanks for that. 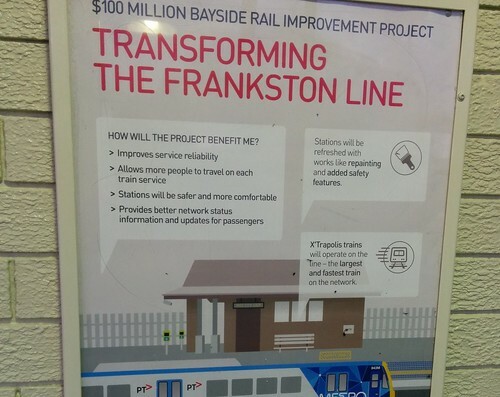 Yes, very curious that Government is not promoting frequent trains on Frankston line since there were 3 seats along that line that swung to the Coalition last election to get them in government. So why not publicise it? The Dandenong line is also due to get 10 minute weekday services at the next timetable change during the year. That would be a perfect time to advertise the frequency increases. Are they also removing the Newport lines from the loop on week-ends? With a 10 minute frequency to Newport? 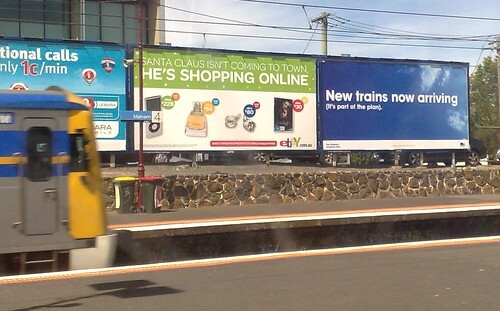 Does that ad say that the X’Traps are the fastest trains on the network? The same ones that are limited to 90km/h? They’re the fastest in a sprint but would be mauled in a marathon. 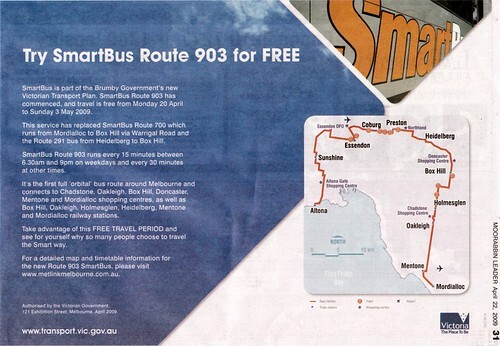 The “free trial” of route 903 just compounds matters: money spent on promotion, and money forgone from the farebox. The bus is either needed or it isn’t (in my observation at the Mentone end, it isn’t.) It isn’t the role of government to stimulate demand for a service running at a loss. Money spenf on political advertising like this should be retrospectively paid back by levying the persons who were members of the political party in power at the time. I would go back to Bracks, when it first started to get out of hand. It makes my blood boil that they are so blatant about it. So that is a yes to 10 minute services to Newport then? They will have to update their 10 minute frequency on the weekend ads. 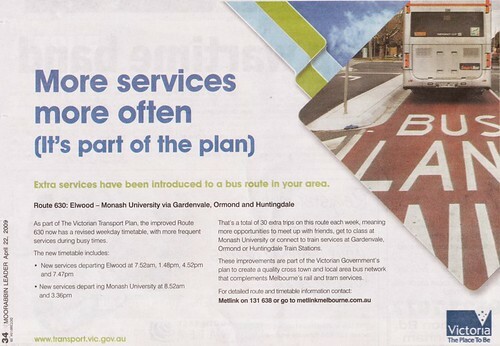 With Newport and Dandenong getting 10 minute services on weekdays, they could run weekday 10 minute service ads as well. HA! X’Trapolis, or should I say X’Crapolis trains are the slowest, even the Hitatchi trains have a maximum speed of 113km/h whilst X”craps are limited to 90km from their Maximum of 148km/h, THATS 58KM SLOWER! The Seimens train would be the fastest with the maximum being 148km/h, Max operating 130km/h and limited to 115km/h, plus they’re MUCH more comfortable. (A train driver I know said it was because the X’Traps are lighter and they also have spring suspension) I wonder if the Pakenham line gets a speed increase to 130km/h to cut travel times. Interesting comparison. 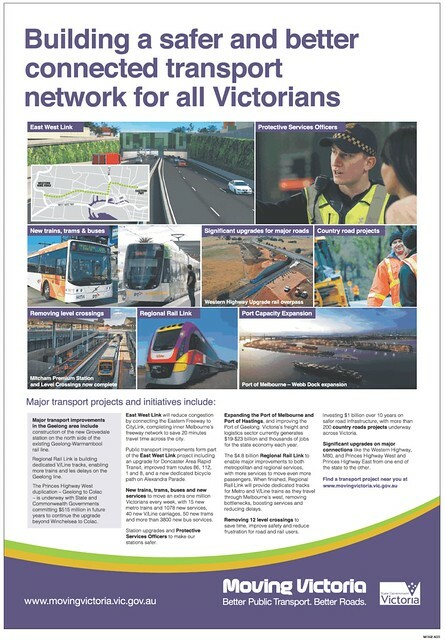 The Libs went to the last election with a lot of promises but haven’t delivered much, and the absence of their proposed “quick wins” like the Southland train station is glaring. 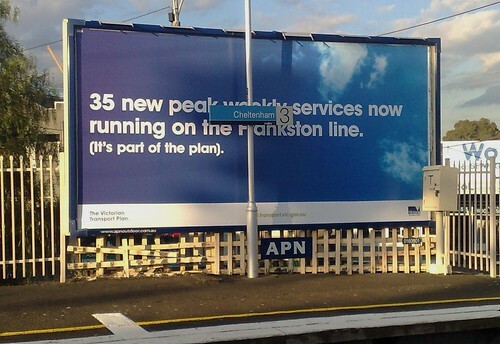 On another note, these PT ads aren’t nearly as on the nose as the awful Speed Camera Urban Myths ad running at present (http://youtu.be/JCKcuEK9jhI). It’s like the government have given up on asking people to adhere to speed limits and are instead pushing positive PR for the cameras!